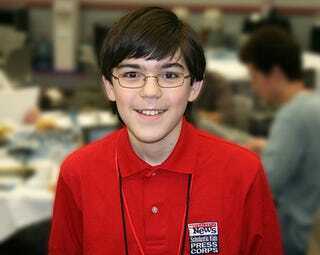 Meet Aaron Broder, the 14-year-old reporter and member of the Scholastic Kids Press Corps. He's covering CES from start to finish. Chaperoned by his mom, the resourceful young man convinced the CES suits to bend the "no one under 16, no exceptions" rule to grant him a press pass. Good move, because after all, there are millions of people his age who are tech experts (and who read Gizmodo), and it's about time they got some press representation.